The hilts are massive and ridged, and have a tapering cross-section. The pommel is divided into three sections and the middle section is the tallest. Both the pommel and the guards are richly ornamented with inlaid sections of alternating recessed and raised areas. The recessed areas were inlaid with bronze or copper, the elevated areas with silver. Otherwise the patterns could differ. A separate group is furnished with rows of raised small bronze knobs with a silver coating. They shall apparently depict small animal heads (fig. 60). Others have rows of cruciform figures (fig.59). Again others have small raised knobs in the shape of squares. Different patterns also exist (consult the picture references in the inventory over types). Frequently there are rivet heads, often large ones, on the upper and lower sides of the lower guard. Likewise, the pommel is attached [to the upper guard] with rivets. The tang [grip] is also often covered with the same kind of metal coating, which in many instances is quite well preserved. Below the upper guard and above the lower guard there is often a véttrim [ferrule] of bronze, created by closely placed animal heads or imitations thereof, just like those we heard of under the previous type in the sword from Orkney. The guards can reach a thickness of 3.4cm, and the pommel up to 4cm, so the swords have impressive upper hilts. Even though none of the swords have the entire blade preserved and therefore not their full weight either, they are nevertheless among the heaviest swords of the Viking Age. C 8095 weighs 1.476 kg and [~70] C 1977 weighs 1.346 kg. The type, with its massive hilts, makes overall a heavy but at the same time magnificent impression. In this country I know these swords now in eleven specimens. The blades are in most cases very poorly preserved. They are all double-edged, but damascening is only seen in one specimen. Two were put down without a blade. 1. C 16276. In the vicinity of Moss, Smaal. (Depicted in Ab. 1891 pl. II, fig. 8). 2. C 1868. Prestegaarden Aas, Akh. 3. C 1977. Ophus, Vang, Hed. (Depicted in Rygh: Norske Oldsager no. 506 and Undset: Til kundskap om vor yngre jernalder p. 7 fig. 2). 4. C 4058. Bjørke, Brandbu, Krist. 5. C 4072. Vaage, Krist. (Depicted in Ab. 1867 pl. III 31 and Undset 1.c. pl. II fig. I). 6. C 11554 b. Rugland, Mandal, L.M. 7. St. 3962 a-b. Klepp, Stav. (Not yet published). 8. B 1481. Halsnø kloster, Fjeldberg, S.B. (Loranges Katalog p.143 and Schetelig: Vestlandets ældste kulturhistorie p.72 fig. 94). 9. B 5774. Viken, Indre Holmedal, N.B. (Depicted Berg. Mus. Aarb. 1903 no.3 fig.10 p.35). 10. B 6154. Henne, Gloppen, N.B. (Depicted in Berg.Mus.Aarb. 1908 no.3 fig.13 p.39). 11. C 8095. Unknown location (Telemarken?) (Depicted in Ab. 1877 pl.V fig.22). In 1890, I. Undset undertook to write an inventory of swords of this type that were found in this country. Seven swords occupy his inventory list, although of these we have to discount his T 63 since this latter sword is from the Middle Ages and has a completely round pommel. In the time since he wrote this inventory five additional swords have been found, almost doubling the number of swords. As one can see, the type has an unusually even distribution across the country, although it is lacking in the northern mountain regions. Other weapons appearing together with this sword type are spearheads of the E and F type, axes of type D and an extended form of type A, and shield bosses like R 564. Finally, there are older rattles found in two of the finds. Based on the find combinations the determination of a time period should be evident. Accordingly, the type ought to be from the early Viking Age. The spearheads of the E-type and axes of the D-type points thereto. Likewise, it is clearly evident that the axe-blade C 1978 is [~71] closely related to the A-type. The shield bosses and the rattles point in the same direction. It is a little different with the spearhead of the F-type, which actually can go back to the middle of the 9th century. That the find (C 16276 ff) belongs among the earliest finds is shown by the occurrence of an axe-blade of the D-type in the same find. It is also possible that not all the swords of this type occurred simultaneously, even if they belong to the same main type. It is possible that exactly this group that sword C 16276 represents, fig.60, belongs to a somewhat later time period than, for example, C 1977. As we shall see shortly, a sword of this type that belongs to the same group was also found in Sweden. This sword apparently appeared together with fittings of bronze that decidedly belong to the end of the 9th century. Of great significance when considering the determination of a time period, is a sword hilt of silver quite the same type, which is at present in the Statens historiska museum in Stockholm (Inv.-nr.6214). The hilt is cast and along the sides there are sections ornamented with animal figures in an older Karolinian style and possibly also style III. There is even another fact that points to the type being old, and that is the outer shape with the ridged guards and the pommel divided in three segments. Sometimes it has a trace of animal heads on the sides. However, it is first and foremost the rivet heads [~72] on the lower guard that points thereto, as for example is the case with C 1977 or with S.Müller: Ordning, Jernalderen. No.580. From the evidence we have viewed it becomes apparent that this is not a predominantly domestic type, as opposed to the three previous types where this was the case. Undset has already in the aforementioned treatise pointed to the fact that C 4072 has a striking resemblance to a sword from Hungary, pictured in Undset 1.c. pl.I fig.I. Consequently he is of the opinion that the entire type is from there [Hungary]. However, this is not the only place outside our country where the type exists. If we look further west, we have first one magnificent specimen from Kilmainham, 65 kilometers northwest of Dublin. This one has small knobs in the shape of small animal heads, as was the case with the sword from Smaalenene. Likewise, we find the type in Scotland from the Island of Eigg. The patterns differ on these four western swords, but the main type is quite the same. Characteristically, it seems that two of the Irish swords are of the same type as the sword from Smaalenene; the other depicted in Worsaae also have «véttrim» [ferrules] just like sword C 1977. Curiously enough, this sword is single-edged. Especially extraordinary is the third sword from Ireland where the raised sections has its own distinctive character, but where the «véttrim» [ferrules] remind us strongly of those found on sword C 8095 from an unknown location. The Scottish sword also shows a remarkable pattern; [~73] where the raised sections in part create half circles that are placed towards one another. To some extent it shows similarity with the Russian sword depicted in T.J.Arne: La Suède et l'Orient, p.53 fig.40, outfitted with small circles in points on the surface, quite like the third Irish sword. With this included, the material outside of the Nordic area has been exhausted. One specimen of this type is also known in Sweden, namely in Statens historiska museum, Inv.-no.14146: 3 from Linga in Södermanland. It was found together with spearheads of my E-type, and [is] therefore similar to the Norwegian finds. There is a fitting in the find that presumably dates the find to the 10th century, but the fitting could also be dated to the 9th century. The author concedes that the sword belongs to the 9th century, but is viewed as a fine showpiece that has been well preserved over a long period of time. The fitting must have brought the date of the find down towards the end of the 9th century, but not much further down than to a little over the middle of the century can this type, according to the Norwegian finds be dated. The author's opinion on this particular point might very well be valid in this instance. However, based on his knowledge of this type (he knows, in addition to the Swedish specimen, only the Irish sword from Kilmainham that he also depicts), it is quite misleading when he determines the type to be Swedish of which one specimen has made its way to Ireland. If one looks at this one group of type D, with rows of coarsely executed animal heads, we know of two specimens from this group here in Norway (C 16276 and B 1481). Furthermore, there is one more in Ireland (Worsaae 1.c. p.406 fig.1). Finally, in Vendsyssel in Jylland a buckle was found that has form and ornamentation quite like the swords. Considering that in this group we know two in Norway, two in Ireland, one in Jylland and one in Sweden, and then take into account those connections present between Norway and Ireland and Norway and North-Jylland during those times, it would be much more appropriate to call this sub-group within the type more Norwegian than Swedish. However, I shall be satisfied by calling it Nordic. 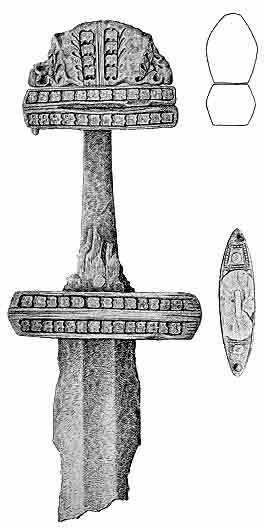 Incidentally a sword of type D was found in Jylland, although not exactly belonging to the same sub-group as the sword from Linga belongs to. This is the sword depicted in S.Müller: Ordning, Jernalderen 580 and Vor Oldtid p.656 fig.407. That a sword like the one from Gudbrandsdalen (C 4072) has a foreign origin cannot very well be called into question, and its kinship with the Hungarian sword depicted in Undset, cannot easily be denied either. On the other hand it seems as reasonable that the Norwegian-Irish group with the small animal head knobs is of domestic origin. The single-edged blade on one of the Irish swords points to it being of a Norwegian, most likely West-Norwegian [~74] origin. Neither does it seem unreasonable that individual specimens of the remaining swords can at least have their origin from Norway. The case seems to be that based on foreign patterns, simpler swords have been made domestically, and partly changed to conform to domestic tastes. As we will see, the entire type to follow [type E] is a distinctive form of this domestic development; one that has experienced a greater distribution than any other type.